Class and sophistication are two words that easily describe these beautiful favors. 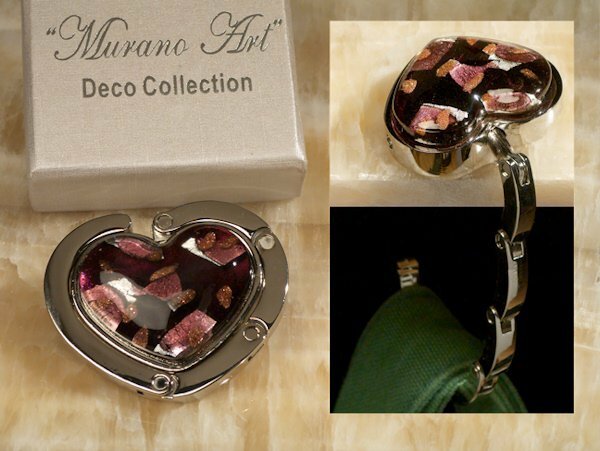 Inspired by the artisans of Murano, Italy, this handbag holder features a purple, gold and silver flake handmade heart shaped glass design attached to a metal hook to keep your handbag hanging safely off the floor. No two are exactly alike! Each handbag holder is packaged in a two piece elegant white gift box and set in a pillow soft satin lining. Measures approximately 4" x 2".